Registration is now open for Keeping History Above Water: Nantucket! Click here to visit our symposium site and register. Nantucket Island has long looked to the ocean to determine its future. From fishing village to international whaling port to beloved seaside escape, the waters that surround Nantucket have always inspired. A National Historic Landmark with more than 800 pre-Civil War era historic structures, Nantucket is one of countless coastal communities who now must rethink its relationship with the sea. Keeping History Above Water: Nantucket is a two-day workshop on Nantucket that will bring together members of the island community, stakeholders from other coastal communities across the Commonwealth of Massachusetts, and national experts to share experiences and case studies. On Day One, participants will learn from the successes and lessons of other historic coastal communities. Participants will turn their focus to Nantucket on Day Two, using state-of-the-art laser scanning models to help envision sea level rise and an old-fashioned roundtable discussion to propose solutions. The convening kicks off with keynote speaker Jeff Goodell, author of The Water Will Come: Rising Seas, Sinking Cities, and the Remaking of the Civilized World. Donovan Rypkema, preservation economics expert, and James Balog of the film The Human Element are special presenters. This is the fifth iteration of Keeping History Above Water and is a partnership between the University of Florida, Nantucket Preservation Trust, and Town of Nantucket, in collaboration with the Newport Restoration Foundation. The 2019 conference is presented by University of Florida: Preservation Institute Nantucket, Nantucket Preservation Trust and the Town of Nantucket, in collaboration with the Newport Restoration Foundation and ReMain Nantucket. 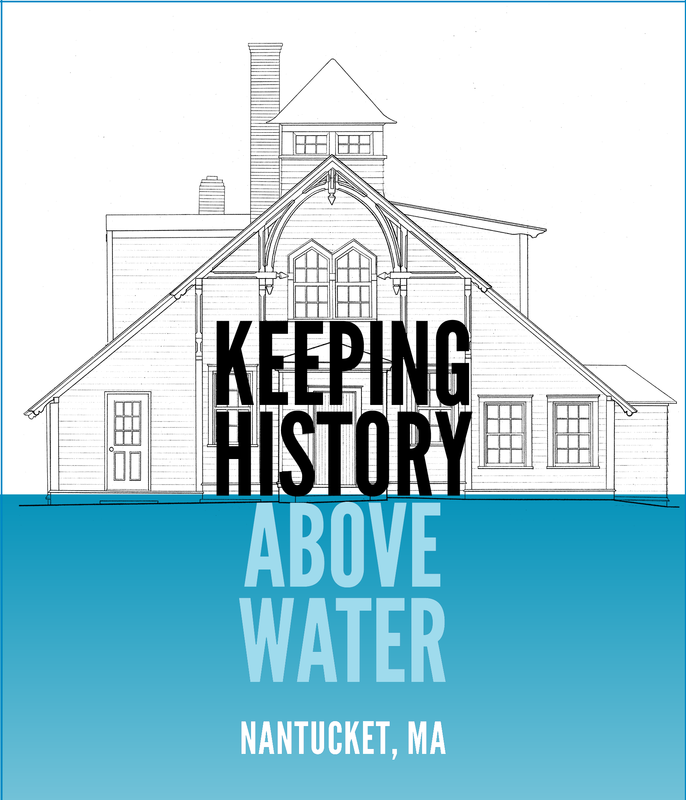 Registration for Keeping History Above Water: Nantucket is now open! Register as a Leadership Supporter to help sponsor this important symposium. “You’ve got to practically row to my front door as it is.” That’s what one resident on Brant Point said in 1996. This week, we continue our two-part series on historic flooding on Nantucket. What do these flooding events mean for our historic structures? What can we do today, and how can we plan for the future? This June 26-28, we hope you’ll join the University of Florida: Preservation Institute Nantucket, Nantucket Preservation Trust, and Town of Nantucket for a two-day symposium entitled Keeping History Above Water: Nantucket, in collaboration with the Newport Restoration Foundation and ReMain Nantucket. We combed through the archives of The Inquirer and Mirror to see how flooding has affected Nantucket from the 1940s to the present. Click here to read Part One, from 1890 to 1930. February: “The most spectacular happening occurred when the high waves smashed the piles at Straight Wharf which supported Yerxa’s boat shop. The mishap took place Thursday morning, after the wharf had been battered all night. The beating waves did considerable damage to the south wall of the wharf and the bulkheads, and the gale blew in part of a wood shed. William Thomson, manager of Killen Bros., Inc., estimated the damage in excess of $1,000. March: “The severe flooding of the Brant Point and Washington Street areas last weekend has been the main topic of discussion in Town this week, and, unfortunately, a great deal of criticism of both the local Police Department and the Coast Guard has been heard. This criticism has stemmed mainly from the fact that many people believe, and rightly, that advance notice should have been given of the rising waters so that families could have evacuated before the storm reached its peak. Actually, advance warning was almost impossible, due to the rapidity with which the water rose. April 3rd: “Another Sewer Break! A major break in the low level sewer main on Union Street, at Consue, occurred Tuesday afternoon and that section has been closed to all traffic for the balance of the week while the Sewer Department workers were making repairs. The men worked under difficulties having to cope with water continually flooding the trench as a result of recent heavy rains. December: “Before the October noreaster, the shoreline along Hulbert Avenue was lined with bulkheads that were built by homeowners to prevent erosion. Gale force winds and raging tides ravaged the bolted wooden structures, leaving them in splintered disarray. December: “Wiring work permits related to the October 30 storm are being issued at five times the rate of nonstorm permits, and Wiring Inspector Tom Cassano says this is only the beginning. December: “The nor’easter that washed six ‘Sconset houses into the sea, flooded Brant Point and sections of downtown last weekend left in its wake almost $9 million in damage to Nantucket. Damage from the storm totaled about $7 million dollars to private residences, $2.5 million to island business and approximately $400,000 to town and public property, according to Selectmen’s Executive Secretary Suzanne Kennedy. November: “Carol and Hugo Pagliccia live on a sponge. Their house sits on what used to be a cranberry bog just off North Beach Street. With the prodigious amount of rainfall this year, that bog has begun to recharge itself. The crawl space beneath their house has been filled with water for months: For a few weeks, they needed waders to get. to their front door. The Pagliccias say they have been pumping water and digging trenches to no avail. “The water has nowhere to go around here,” Carol Pagliccia said. “It just sits there and it smells. We have never dried up since the spring.” The worry of the Pagliccias, and their neighbors behind the Stone Barn Inn, is that the Jetties/Brant Point area cannot tolerate any more building. “You hear about, all these buildings going up on lots that are already covered with water,” said Sonya Murphy, who lives three doors down from the Pagliccias. Tm just worried about the combination of all these things. Where is the water going to go?” North Beach Street is one answer. …”Brant Point never dried out after the No Name Storm,” said ConCom member Diane McColl, referring to the storm of 1991. “We’ve had flooding problems, storm drain runoffs problems and we’re filling up the places for the water to go.” Yet Perry and ConCom members say they are largely powerless to stop further building. October: “Many homes in the flood plain are on the move and on the rise. The action is a result of the Federal Emergency Management Agency’s updated flood maps published last July 2014. The unpredictable floodplains are impacting insurance costs, forcing some residents to raise their homes and others to get creative. December: “The blizzard called Juno by the Weather Channel lashed the island with an icy vengeance Jan. 26 and 27, raging for more than 16 hours, flooding much of the downtown waterfront and significantly damaging the town pier. …Newly-elected Gov. Charlie Baker arrived by helicopter and toured the island when the blizzard finally subsided, meeting with emergency-management officials at the Fairgrounds Road public-safety building and visiting the damaged town pier, which officials estimated would cost nearly $1 million to fix. 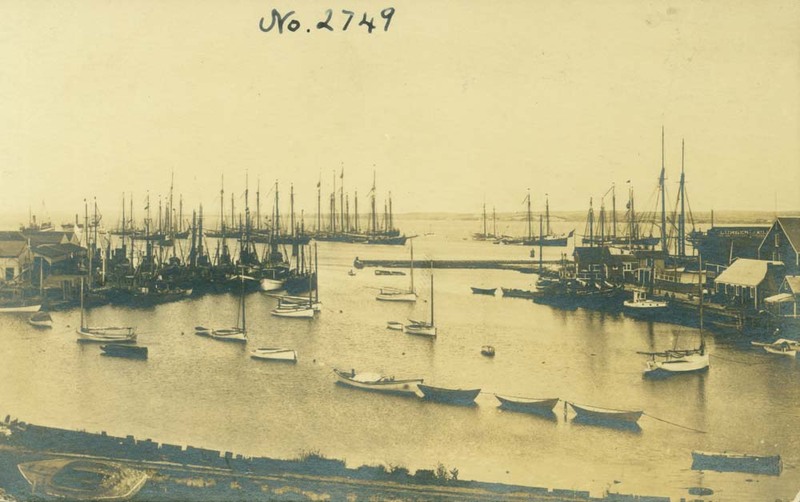 Postcard image of the Easy Street boat basin full of fishing fleet boats gathered for protection escaping the storm on 1917. NHA archives. Winter on Nantucket means punishing winds, high tides, and storm surges. Many of the low-lying areas of Nantucket town experience flooding during storm events. What do these flooding events mean for our historic structures? What can we do today, and how can we plan for the future? This June 27-28, we hope you’ll join Preservation Institute Nantucket, Nantucket Preservation Trust, and the Town of Nantucket for a two-day symposium entitled Keeping History Above Water: Nantucket, in collaboration with the Newport Restoration Foundation. We’re building on the important foundational work started in Newport. Click here to read more about Newport Restoration Foundation and past Keeping History Above Water events. In the months leading up to the symposium, we’ll feature different topics related to sea level rise and historic preservation. Since we’re in the middle of winter and severe weather concerns are on the mind, we thought we’d kick off this series by looking at flooding on Nantucket throughout history. Next week, we’ll look at 1930 to the present. Do you have memories of flooding on Brant Point or other areas of town? Please email us at info@nantucketpreservation.org and let us know if we can use your recollections for our blog and archives.